My experience so far has been pleasant. The office staff is very friendly and has a lot of patience with its residents myself included. The community is very quiet and well kept for families of any sort. I feel safe within the gates of heritage at night and never have to worry about outside noise. Thank you for taking the time to review Heritage on Millenia. We appreciate your compliments about the community and are glad that you decided to call Heritage home. The staff is excellent. They are always eager to help and are polite. If you need anything just ask and you'll be helped. The community is quiet and well maintained. I love living here! Everything is maintained well and staff is helpful when you need something. The only issue I've had has been parking occasionally but besides that I cannot complain! Incredible amenities at an unbeatable price. The community is very well kept and the staff is very helpful. Looked in several locations prior to renting here and found much less impressive places that cost just as much. Really is a great find! We appreciate your compliments about the staff and community. We are so happy that you are enjoying living here at Heritage. The complex exceeds my expectations. There are only a few things that wish came standard such as valet trash, water, and sewer. Also, I wish there was better parking. It's difficult to find parking when I get home from work late. Besides those items, it's a wonderful place to live. Thank you for taking the time to post a review about Heritage on Millenia. We are so happy that you are enjoying living here at Heritage. Peaceful and secure community. Family oriented and pet friendly. Great staff and very clean community with pool, gym, pool table, theatre, and business center. Heritage on Millenia has been a great place to live thus far. The office staff is very helpful and maintenance requests are answered in adequate time. The complex is quiet and well taken care of. Thank you for yourwarmly welcome at Heritage on Millenia. We hope our experience as residents, be nice, friendly, warmly, and successfully . Thank you for taking the time to review Heritage on Millenia. We appreciate your compliments and are glad that you decided to call Heritage home. I have been living here since 2013. The grounds are well kept, the facilities; Gym, pool, and clubhouse are excellent, and the management and staff are proactive, helpful, and extremely accommodating. The residence is extremely pet friendly and even added a dog park recently. It is a pleasure living here. Nice property and very safe.. Very friendly office staff .. The Maintenance team always do a great job..kind.. cordial and always ready to get the job done. I like the gym..pool area and the fun activities the staff organize.. It's a great place. Wish we could have a solution for the parking situation. It's not fair for the money we pay not to have a guaranteed parking space . Other wise everything is great !! Thank you for taking the time to post a review about Heritage on Millenia. We are happy to hear that you are enjoying living here at our community. We appreciate your compliments about the staff and the community. Place looks very nice, clean pool, friendly staff, neighborhood looks safe, right next to everything, 2 minutes away from millenia mall, 10 minutes away fromy universal and about 20 minutes away from disney! Thank you for taking the time to review Heritage on Millenia. We appreciate your compliments. We appreciate your compliments about the staff and community. We are happy that you are enjoying living here at Heritage. Thank you again for your comments, as well as your continued residency. Ilse & staff has been super helpful in the process of moving in, and kept us up to date on when units are available to view. Can't wait to move in! Thank you for taking the time to review Heritage on Millenia. We appreciate your compliments about Ilse and the staff and are glad that you decided to call Heritage home. Before moving in, the staff really helped out to get everything facilitated and moving. I'm excited to start living there. Very great staff and facilities. Thank you for taking the time to review Heritage on Millenia. We appreciate your compliments about the staff. Great place to live. I love the quite time rule where no one is supposed to make noise from 11 pm -8 am perfect to get a good night sleep. The theather is a great way to entertain. So far Heritage has been great. The apartments are large and beautiful. The only issue is you can hear when people are walking around above you and we've already had complaints from our downstairs neighbors about us walking around. I think the floors are just very very thin. Thank you for taking the time to post a review about Heritage on Millenia. We appreciate your feedback. 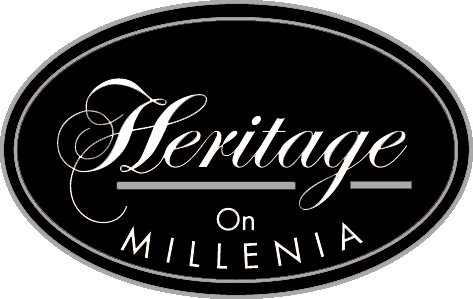 Thank you for taking the time to post a review about Heritage on Millenia. We are happy to hear that you are enjoying your apartment. I love Heritage on Millenia! The apartments are beautiful, neighbors are friendly, the front office staff is awesome! I feel very at home here! We appreciate your compliments about the staff and community. We are so happy that you are enjoying living here at Heritage. Thank you again for your comments. Doing great. But, I think you can do better my making some changes. For example, if one person opens the gate, easily 4-5 people can follow. This can be avoided by installing a small plastic barrier gate.